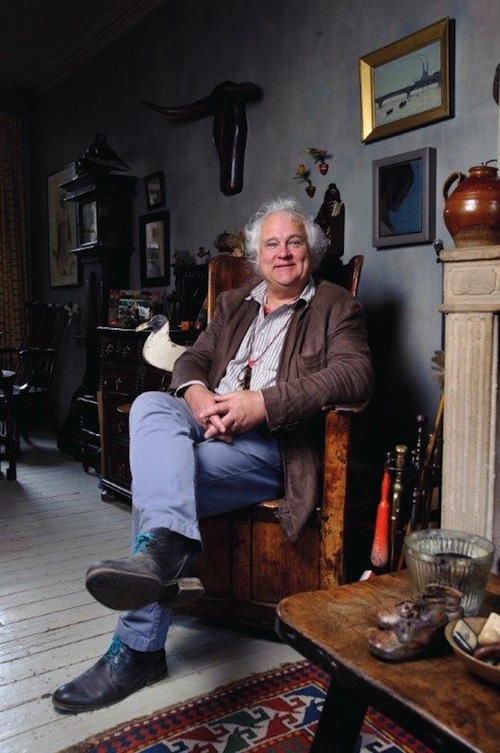 Robert Young is one of the UK’s leading dealers in folk art. However, his folk art is not ‘folksy’. His pieces might be primitive or naïve, but have been chosen for having individuality and an aesthetic. His priority is `strength of image’, something that stands out; that you can read from a distance.’ This applies not only to a painting, but needlework, stick chairs, tavern tables, treen and ceramics. Coupled to this, it has to have what he calls an integrity of surface. It also needs to have retained original colour, the layers of old paint and polish we describe as patina, retaining its wear and faults through use and time. Folk art was made for use, so the history of an object should be preserved. He hates anything over-restored or stripped. Young celebrates the object and its history but not in an academic sense. Objects have an aesthetic appeal that he hopes his clients will share. When it comes to design and how to place objects in interiors, Robert and his wife, Josyane, who deals with the decorating side of their business, have some basic rules. This is an excerpt from a full article taken from the September issue of Antique Collecting. To read the full article take a look at our subscription options in both print and digital.